The Ord surface water allocation plan and Ord surface water allocation plan: Statement of response were released in October 2013. 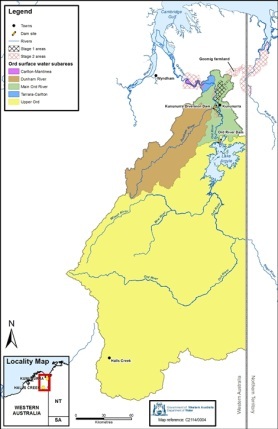 The Managing waterfrom the Ord River brochurewas released in March 2014. The plan replaces the Ord River water management plan and sets a new approach for managing water allocation and licensing in the area. The department prepared the plan to manage the growing water demands on the Ord River. The plan will be used to manage competing demands for water between hydroelectricity generation and the expanding irrigation industry, while maintaining sufficient flow into the lower Ord River to protect the riverine environment. A total of 865 GL/year is secured from existing infrastructure, to meet current and future irrigation demand. Water release rules are defined for the Ord River Dam power station so that it meets downstream irrigation and environmental commitments, while maximising hydroelectricity generation. When storage levels become low, water will be shared, through water restrictions for hydropower, irrigation and the environment. It explains the process by which we license water use and adjust water licences as demand from irrigation and hydroelectricity changes over time. At 650 kilometres long, the Ord River in the east Kimberley is one of the state's major river systems and the Ord River Basin drains an area of 55 100 km2. It includes lakes Argyle and the town of Kununurra. The plan covers the Western Australian part of the Ord River catchment – specfically the Ord River and Tributaries surface water area and the Ord River Irrigation District. The plan covers the broader Ord River catchment, encompassing the Ord and Dunham rivers and tributaries. It includes the surface water resources of the Ord River catchment to its tidal limit, including run-off from the Northern Territory that contributes to the Ord River. For management purposes, the plan area is divided into five subareas – Upper Ord, Main Ord, Tarrara-Carlton, Carlton-Mantinea and Dunham River.